DYSPORT™ is a prescription medicine that can be used as an anti wrinkle treatment. It is injected into muscles and used to improve the look of frown lines between the eyebrows (glabellar lines) in adults younger than 65 years of age for a short period of time (temporary). Frown lines (wrinkles) happen because the muscles that control facial expression are used often (muscle tightening over and over). After DYSPORT™ is injected into the muscles that control facial expression, the medicine stops the tightening of these muscles for up to 4 months. When used as an aesthetic treatment, Dysport can temporarily improve the look of moderate to severe frown lines between the eyebrows in adults. 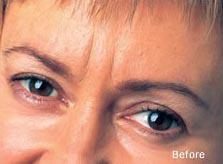 Frown lines appear when the muscles that control facial expression are used often (muscle tightening over and over). DYSPORT™ relaxes these muscles for up to four months. What is a Dysport™ treatment like? DYSPORT™ is injected into the affected muscles and it is administered by a doctor. You may receive another dose of DYSPORT™ after 12 weeks or longer, if it is needed. The dose of DYSPORT™ is different from other botulinum toxin products. How often will I need retreatment with Dysport? Treatments with Dysport are typically 3 to 4 months apart or longer, depending on when your symptoms return. In clinical studies, half of all patients receiving Dysport went 14 weeks or longer between treatments. Retreatment should not be less than 12 weeks after the last injection. Your doctor will work with you to decide how often you need to be treated. Treatments with Dysport may be 3 to 4 months apart or longer. Retreatment should not be less than 12 weeks after the last injection. Depending on your response, your doctor may adjust your total dose of Dysport or inject different muscles on your next visit. In this way, your treatment is customized until it is best suited to you.